This zesty, easy-to-make cake uses simple ingredients that you may already have on hand, but don’t let that fool you! A skipped trip to the grocery store and minimal effort in the kitchen is no indication of this little gem’s ability to make a grand impression – This is just where the beauty of its understatement begins to shine. It’ll hold its own on a table beside the fancy hors d’oeuvres, yet it’s simple enough to whip up even when that occasion is just you and a relaxing afternoon. This cake’s delightful simplicity speaks volumes and is sure to impress your brunch or dinner guests with its minimal elegance and big flavor, while making your life a little easier! It doesn’t get any better than that! Preheat oven to 350º F, and lightly grease and flour a 10 inch bundt pan. In a large bowl or mixer, beat sugar and butter together until thick and creamy. One by one, beat in eggs, waiting until each is fully incorporated before adding the next. Slowly pour in milk and mix until fully combined. In a separate bowl, combine wheat flour, baking powder, lime zest and salt. Gradually mix into egg mixture, until fully combined. 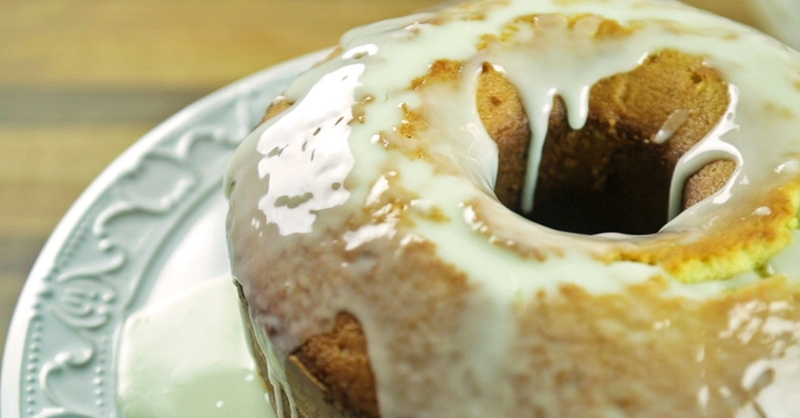 Pour batter into greased bundt pan and bake for 45 minutes. When cake is done, transfer it from the bundt pan and invert it onto a serving platter. Let cool and pour lime glaze over the top.